When the weather turns warmer, we turn to coolers. Preferably of the tall, slow sippin’ variety. 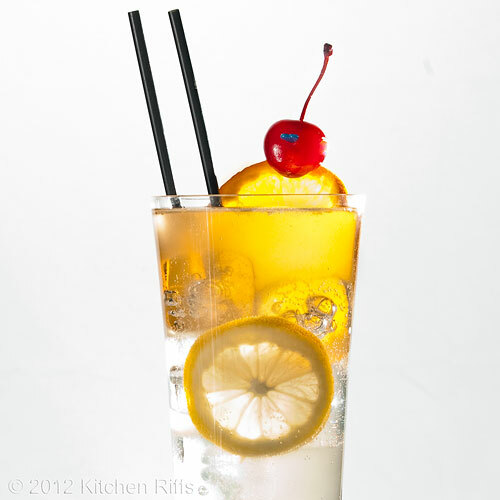 The Tom Collins is a classic cooler, with a crisp lemony flavor that beats the hottest sun. It’s gin-based, but you can make an admirable alcohol-free variety for those who don’t drink. It’s refreshing and delicious — what more could you ask? Oh, easy to make? It’s that, too. The Tom Collins is the “little black dress” of cocktails: classic, timeless, and always appropriate. Though it waxes and wanes in popularity — it’s probably waning at the moment, overshadowed by the Mojito — you know it’s always there, just waiting for the proper occasion. And that occasion is, well, any time the weather is hot and you’re thirsty! This is a versatile beverage. It’s great to sip poolside or at a summer cocktail party. For this drink, you should use a tall glass that holds 10 to 14 ounces (12 is ideal). The recipe serves one, but as with other cocktail recipes, you can easily scale it up to make any number of drinks. Mixing time is 5 minutes (or less). Add the gin, lemon juice, and Simple Syrup into a cocktail shaker half-filled with ice (you can also mix this drink in the glass; see Notes). Shake until cold (20 seconds), then strain into a tall glass filled to within an inch of the lip with ice cubes or cracked ice. Top off with club soda or seltzer, and garnish with a maraschino cherry and orange wheel. Add a pair of tall straws to make sippin’ easy. Serve. This drink was originally made with Old Tom-brand gin, which contained sweetener. In recent years, Old Tom has become available again, but you’ll find it only at liquor stores that take their spirits seriously. If you decide to track down (and use) Old Tom, reduce the amount of sugar when you mix this drink. Most of the gin we drink today is of the “London Dry” variety. According to Wikipedia, this means it’s distilled from agricultural products (usually corn, wheat, rye, and/or barley), with very few additives. The characteristic flavoring (juniper and other herbals) comes from re-distilling it in the presence of aromatics. Some cheap gins are made by adding flavorings to cheap spirits — resulting in an inferior product. Avoid any gin that carries a suspiciously low price. There is also Dutch (or “genever,” meaning juniper) gin, which was probably the original form of gin. It is distilled in a manner similar to London Dry Gin, but at lower proof and with the flavorings possibly added during the distillation process. This gin sometimes has a malty flavor (in addition to the juniper). It is still produced (and is popular in the Netherlands and Belgium), but it’s not easy to find in the US. Any name-brand gin works well in a Tom Collins (and in many other cocktails, for that matter). Beefeater is a good, standard brand that every liquor store carries, and it’s my go-to (although there are lots of other brands I like too). It’s better to use Simple Syrup rather than table sugar when making this (or almost any) drink. Why? Because simple syrup is a liquid solution, so it dissolves instantly. Table sugar can take a while to dissolve. I like to shake the ingredients for this drink because shaking does a better job of blending in the lemon juice. But you can make the drink in the glass, if you wish. Simply add the gin, simple syrup, and lemon juice, then stir until the juice is well incorporated. Top up with fizzy water. . Although gin adds great flavor to a Tom Collins, you can make a pretty good nonalcoholic version of this drink. Omit the gin and double the amount of lemon juice and simple syrup, and top up with fizzy water and stir briefly. Delicious! (It’s essentially a nice, fizzy lemonade.) Oh, and don't forget the garnish. For sipping your Tom Collins, I suggest investing in some Collins Straws. These are thin cocktail straws that are about 8 inches tall so they fit a Collins glass. They’re usually black. Although you can buy them in some liquor stores, their prices tend to be outrageous. Try visiting a local Restaurant Supply store (many are open to the public) where you’ll pay under $5 for a box of 500. 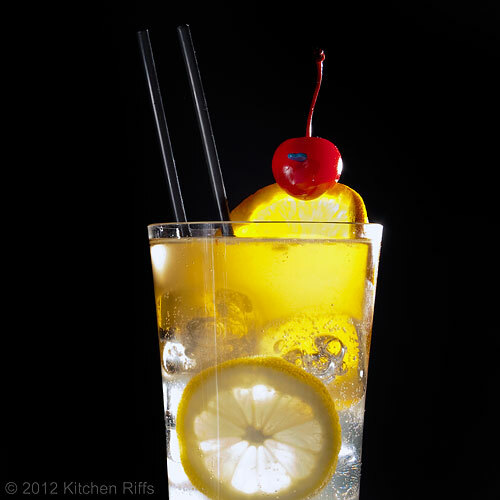 How Did the Tom Collins Get Its Name? One reoccurring theme whenever we discuss cocktail history is how little there really is of it. In most cases, it’s hard to nail down facts and dates concerning a particular drink’s origin. And this is definitely true with the Tom Collins. David Wondrich, cocktail historian extraordinaire, writes in Imbibe! 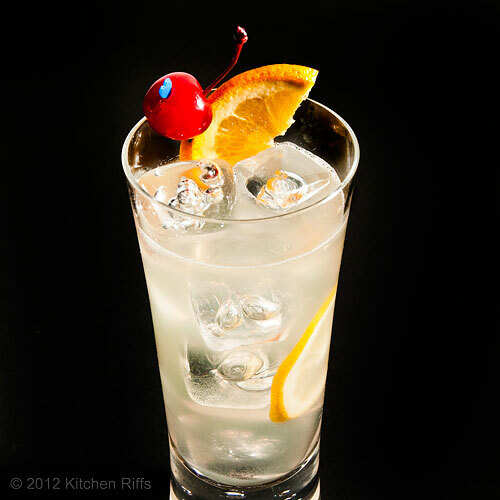 that the Tom Collins originated in England around 1830. But its original name was the John Collins (today a John Collins is a Tom Collins in which whiskey replaces gin). The drink may have crossed the pond to America in the 1850s. By 1865, there are references to it in US print sources. By the time Jerry Thomas, author of one of the earliest authoritative books on American Cocktails, included the drink in the 1876 edition of his Bartender’s Guide, the drink had become the Tom Collins. Why the name change? Both Wondrich and Wikipedia recount the same story: In 1874, an extremely popular practical joke in the US was to ask a “mark” — friend or stranger — whether he’d seen Tom Collins. When the mark answered “no,” the jokester would claim that Tom Collins was talking about the mark to others — saying who knows what! And then the jokester would add that Tom Collins was right inside that bar over there, or around the corner, or wherever. As Wondrich notes, this all sounds “moronic,” but evidently people became upset that the mythical Tom Collins was talking about them — and they would dash off to find (and presumably silence) him. Anyway, informed people speculate that around this time the drink became known as the Tom Collins — borrowing notoriety from the fictional gossip. The Tom Collins — in fact, the entire Collins family of cocktails — belongs to a class of drinks that Gary Regan categorizes as Sparkling Sours in The Joy of Mixology. Traditional sours, like the Whiskey Sour are shorter drinks, often served chilled but without ice. One could make the case — I would — that many other citrus-based drinks fall into the “sour” category (it’s citrus that provides the sour flavor): like the The Classic Margarita, The Classic Daiquiri, and The Sidecar. Essentially, the Collins family contains drinks that have a base spirit, with lemon juice and sugar as the primary flavoring ingredients. A Collins-class drink is served in a tall glass and topped with sparkling water (which is why Regan calls them “sparkling” sours). Oh, and a Collins always features a traditional garnish of orange wheel (or slice) and maraschino cherry. If you substitute whiskey (preferably bourbon or rye) for gin you have a John Collins. Substitute brandy, and you have a Brandy Collins. Substitute tequila, and it’s a Juan Collins. Substitute applejack, and it becomes a Jack Collins. And so on. Although the Mojito and Gin and Tonic also contain citrus juice and are served in tall glasses topped with fizzy water, they don’t qualify as Collins-style drinks because both are made with lime, not lemon. Moreover, in a Mojito, the mint is muddled in the glass (which puts it in the julep family — don’t ask). In the Gin and Tonic, there is no sugar, and the fizzy water is tonic, which has a distinct flavor of its own (unlike the neutral flavor of club soda or seltzer). Do some of these distinctions sound arbitrary and illogical? Why, yes they do. But they are what they are. Fortunately, you don’t need to know any of this stuff to enjoy a Collins. And after you’ve had a couple, you’ll forget it all anyway, right? I'm LOVING all your cocktail recipes!! I've heard of the Tom Collins but never knew what was in it. Adding it to my must-try list! i would have a glass of tom collins cocktail over mojito if you were to ask me. i love the lemony taste, it's refreshing esp on a summer day like this... i really don't like the minty flavor of mojito... but in some days i could tolerate it haha. have a lovely day... cheers! Hi wicked noodle, I'm having a great time doing all of these! 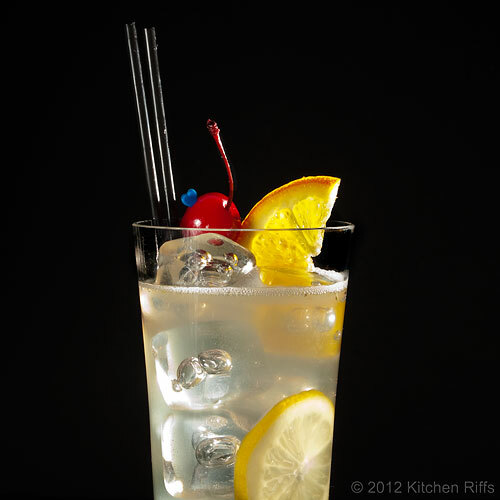 The Tom Collins is a supremely refreshing drink - you'll enjoy it. Thanks for the comment. Hi Malou, although I really like Mojitos, I actually prefer the Tom Collins too - mainly because I'm so in love with lemon. Thanks for the comment. I haven't had a Tom Collins since I was about 25. Tell Lisa that it's 5 o'clock somewhere in the world any time of the day. Works for me. Hi Lisa, this is one of those drinks my parents made (occasionally) back then, too. Very refreshing, and one I don't drink enough. Thanks for your comment. Hi Maureen, I hadn't had one until several years ago; and then a couple of weeks ago was my first since then. Really a great drink - an oldie but a goodie. Thanks for the kind words, and the comment. I loved the history you shared with here on the Tom Collins drink... great post. OMG I love gin and I love Tom collins'. This is gorgeous, I don't know how you do it! Hi Tania, glad you enjoyed it! Thanks for your comment. Hi Julie, thanks for your kind words, and your comment! Sounds to me like the guys in the bar must have had a few of things to think the Tom Collins joke was funny! Been there, done that! :) Even though in the past I was a big gin and tonic drinker, I've never had a Tom Collins. Not sure why because now that I know what it is, it is definitely a drink I would like. Thanks for the recipe and all of the interesting information! Great post! Hi bamskitchen, we're all dying to hear more details about your trip to Italy! This is a great drink - perfect for balcony drinking. And with a view of Victoria Harbor? Heaven! Thanks for the comment. Hi love2dine, ;-) I think I'll join you! Thanks for your comment. Hi mjskit, really bad joke, isn't it? When I was writing about it, though, I was thinking about the old telephone jokes from our youth — specifically the one where you call some establishment that sold tobacco and ask "Do you have Prince Albert in a can?" And when they answered "Yes" you'd reply, "Well, let the poor fellow out before he suffocates!" Of course we were also maybe 12 when we did those pranks. Anyway, in both cases I guess you really had to be there. Anyway, you should give the Tom Collins a try — nice, crisp taste. Thanks for your comment. Hi Marta, gin and tonic is one of my warm weather favs, too. Thanks for your comment. This looks delicious, I'll have to try it out! Also, I have a really interesting article on flavor analysis between different types of gin, if you are interested in reading it! Hi Bethany, it is delicious! I'd love to read the article on gin. I assume it's on your blog? I'll go take a look later this week. Thanks for your comment. Hi Nami, drinks are hard to photograph! First you have to make them look nice, then light them, then avoid unwanted reflection - there's a lot going on. And moving the camera just an inch or two can make a huge difference. My early results really were bad - it's taken a lot of trial and error and practice, and I still have problems. But I'm getting better, and you will too. Thanks for your kind words, and your comment. For the life of me, I don't think I've ever had a Tom Collins. I remember my aunts and uncles ordering them when I was growing up. Now, you have me wanting to try one for sure! Hi Carolyn, although the Tom Collins is a classic, lots of people have never had it. It got pushed out of favor in the big switch to vodka beginning in the 70s. Although you can substitute vodka for gin when making this, it just doesn't have the same pizzazz IMO. If you like gin and you like lemon, you'll like this. Thanks for your comment. Hi Jay, thanks for your kind words and your comment! You are really talented at making them! This sounds very potent! All we need now is the weather over here to warm up. Hi Uru, aw, thank so much for the nice things you said, and the comment. Hi WokandSpoon, I hope you get warm weather soon! Fortunately the weather here in St. Louis is nice and toasty, so a Tom Collins is mighty refreshing. Thanks for your comment. Hi My Man's Belly, thanks! And thanks for taking time to comment. Hi Louise, I agree, such a nice drink for a barbecue. And isn't cocktail history fascinating? (And a bit dopey, in this case!). Thanks for your comment. Hi Marina, it's a great drink for hot weather! Thanks for your kind words, and your comment. Hi Raymund, it probably doesn't sound that appealing right now to you, given winter is coming. Still, you can save the idea for December! For right now, you might want to try a Sidecar - excellent for cooler weather, and great lemon flavor. Thanks for your comment. Hi Terra, beating Arizona heat is an excellent application for the Tom Collins! Just the ticket, I'd say. Thanks for taking time to comment. Hi Carole, I'll definitely check out your post. Thanks for stopping by. This really is the little black dress of cocktails. Thanks for reminding me how totally perfect for summer they are! Hi Katherine, it's such a delicious drink. But lemon is one of my fav flavors, so anything with lemon gets my vote. Thanks for commenting. I've made a Tom Collins at home many times. We went out to lunch one day, and I ordered one. Imagine my surprise when the server brought over a PINK drink. I thought, well, maybe it's just that place, like the bartender didn't know how to make it. I ordered it another restaurant and got the same PINK drink. It must be a Minnesota thing--or they're using grenadine for simple syrup. Hi Chris, how odd! Maybe it's grenadine, although even the relatively tasteless Rose's has some flavor that I'd think you'd detect (although the idea sounds kind of interesting). I wonder if they're using packaged pink lemonade? That would give more or less the right flavor, and would account for the color. Thanks for taking time to comment. Yep, that's a "Minnesota Collins". Sub grenadine for the simple syrup. Any Collins variant will generally use grenadine in MN. Hi BrandeX, thanks for info that there's a Minnesota Collins! I didn't know that, and really appreciate you sharing your knowledge. Thanks for taking time to comment.